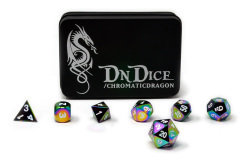 We are very happy to announce our affiliation with DnDice is now LIVE! Simply use the code “PenanceRPG” at the checkout for 5% off all purchases – and as there is a sale of 10% next week, the code will give 10% off instead of 5%. In return we gain a 5% feedback for money spent using the code which we can then use to fund giveaways for you all, such as our last 3333 followers giveaway featuring 2 sets of the stunning Metallic Dragon range – in Brilliant Gold and Silver. Shipping is free within the UK and pretty reasonable abroad too.